Abe Cohen Plumbing and Heating Inc. is who you need to call for hot water heating in commercial buildings in Ahuntsic, Baie D'Urfe, Beaconsfield, Bord du Lac, Cote Saint-Luc, Cote St-Luc, Dollard des Ormeaux, Dorval, Downtown, Hampstead, Ile Bizard, Lachine, Lacey Green, Lakeshore, LaSalle, Laval, Mile End, Montreal West, NDG, Nouveaux St. Laurent, Nun's Island, Old Montreal, Outremont, Pierrefonds, Plateau, Pointe Claire, Pointe St. Charles, Roxboro, Ste-Genevieve, St. Henri, Town of Mount Royal, Verdun, Ville St. Laurent, West Island, Westpark, Westmount. We install, maintain, repair, and replace all brands of gas-fired and electric high-output hot water systems, whether "hot water tank" or tankless (flow-through) type. From replacing a burned element to designing and installing a new water heating system, we have the experience and the skill. We are qualified and licensed to install and repair all of the water and gas lines. We can help you to determine the best type of water heating system for your building, based on the number of occupants, and your usage habits. Determining the correct size of your hot water heating system is essential to ensure a normal life span of your equipment as well as to avoid running out of hot water when you most need it. 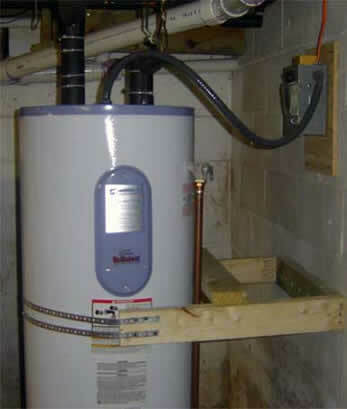 In a commercial building, the hot water tank (water heater) has to provide heated water for many people. This approach to producing and delivering hot water is the least expensive to install and is the most popular. Let us help you to size the system you need for the number of occupants in your commercial building (for rapid heating and rapid recovery). A flow-through (tankless) water heater occupies less space than a water tank, and consumes energy (usually from natural gas or liquid propane) only when hot water is drawn. As soon as hot water is demanded by a faucet or appliance, the heater quickly raises the temperature of the water flowing through it, and will continue to heat the water until the flow stops. On-demand heaters are virtually instant and deliver virtually limitless hot water (within its rated capacity). We can help you to determine whether this type of water heater is to your advantage, whether it is cost-efficient to install, and to size the system and unit(s) to your requirements. At Abe Cohen Plumbing and Heating Inc., we are a three-generation family business with more than 50 years in the plumbing trade. We consider our customers to be family and friends in a long-term relationship with us. We have the experience, expertise, tools, and equipment to quickly repair or replace commercial water heaters in the greater Montreal area. We are respectful, clean, and professional. We are certified and active members of CMMTQ (Corporation des maîtres mécaniciens en tuyauterie du Québec), ACQ (Association de la Construction du Québec), and certified partners of Gaz Métro for natural gas piping and installations.